For twenty years, I have been buying and selling stamps of the Russian Civil War period. Some of them are rare - in fact, quite a lot since there are lots of philatelically-inspired varieties of Armenian and Ukrainian overprints each one of which was only produced in small quantities. How rare is rare? What quantities? Well, sometimes only a single sheet of 50 or 100 was overprinted in such a way as to create an identifiable variety. Sometimes a few sheets. In some cases, we have Official Numbers - in John Bulat's catalogue, you will find them, for example, for Ministerial tridents, Kherson tridents, Courier Field Post overprints, and CMT overprints. In general, these figures are very suspect, since they were published by the entrepreneurs who would benefit financially from sales of the stamps. More bluntly, it's highly unlikely that the figures are truthful. There are ways of estimating numbers independently of official figures. It's obvious if you think about it. Suppose I have a stamp which I think is rare - one sheet of 50 or 100. Then if I get a second copy of the same stamp, then it should be identifiable as from the same sheet - same shade of stamp, same paper, same gum, same perforation, same centering, same position of a lithographic or typographic overprint. If it's not from the same sheet, then immediately you know that there were at least two sheets of this stamp. And so it goes on. In some cases, you will find that every stamp you come across is from a different sheet and so the print number keeps on going up. Then there are the cases where this does not happen. If your second copy of a stamp is clearly from the same sheet as the first copy - but has come to you from a different source - then this increases the probability that there was indeed only one sheet at the beginning. (Maybe there is a statistician out there who can figure this out). Of course, everything depends on how independent the second stamp is from the first. Recently, I bought Peter Ashford's collection of Armenian combined surcharges. Included was a pair of stamps with a 10 rouble surcharge over an existing framed Z overprint on a 70 kopeck imperforate stamp. This is a counter- surcharge (a philatelically-inspired surcharge) since the official scheme specified 25 rouble overprints on 70 kopeck stamps - this is what you will find listed in the Michel catalouge based on Christopher Zakiyan's archival researches. You won't find a 10 rouble surcharge listed there, only in the Stanley Gibbons calogue which is based on Tchilingirian and Ashford's researches. As it happens I already had another pair of the 10 rouble surcharge. I don't know for sure where I got this, but most likely from Dr Ceresa's collection which in turn was based on Tchilingirian's collection (which Ceresa bought at auction). I pulled out my existing pair - and, hey Presto! - the two pairs fit together. The Ashford pair is at the top. 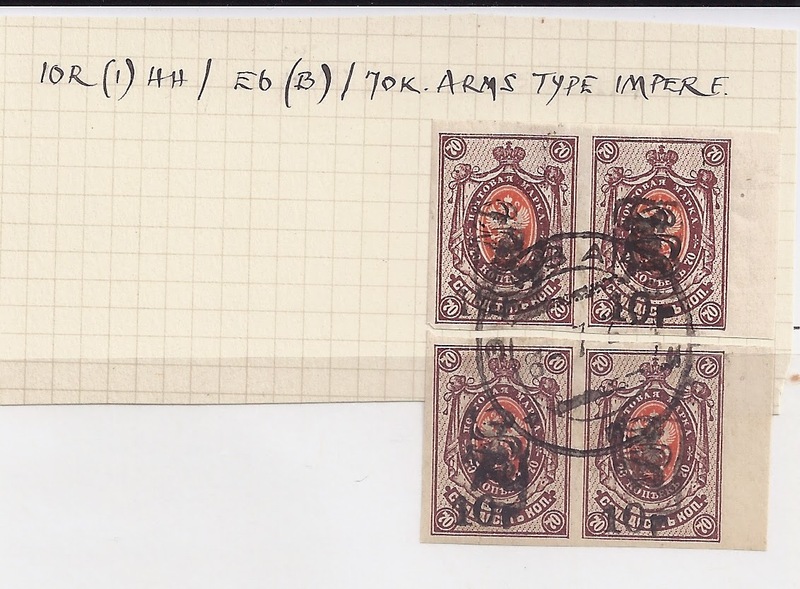 Now, in this case, my guess is this: back in the 1950s - over 60 years ago - when Tchilingirian and Ashford were writing Stamps of Armenia they had just one block of 4 of this (rare) variety. They both wanted it in their collection. So they split the block of 4, something they would not normally have done with a postmarked block. Do you have this stamp in your collection? And is it from the same sheet?